Here is the final volume of Norman O. Brown's trilogy on civilization and its discontents, on humanity's long struggle to master its instincts and the perils that attend that denial of human nature. Following on his famous books Life Against Death and Love's Body, this collection of eleven essays brings Brown's thinking up to 1990 and the fall of Communism in Eastern Europe. Brown writes that "the prophetic tradition is an attempt to give direction to the social structure precipitated by the urban revolution; to resolve its inherent contradictions; to put an end to its injustice, inequality, anomie, the state of war . . . that has been its history from start to finish." Affiliating himself with prophets from Muhammad to Blake and Emerson, Brown offers further meditations on what's wrong with Western civilization and what we might do about it. Thus the duality in his title: crisis and the hope for change. In pieces both poetic and philosophical, Brown's attention ranges over Greek mythology, Islam, Spinoza, and Finnegan's Wake. The collection includes an autobiographical essay musing on Brown's own intellectual development. The final piece, "Dionysus in 1990," draws on Freud and the work of Georges Bataille to link the recent changes in the world's economies with mankind's primordial drive to accumulation, waste, and death. Norman O. 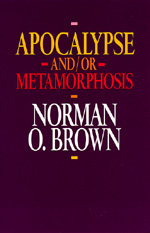 Brown (1913-2002) was Professor of Humanities, Emeritus, at the University of California, Santa Cruz. His Love's Body (1966) is available from University of California Press in paperback.